FILE - U.S. Secretary of State Mike Pompeo speaks during an event at the State Department in Washington, June 28, 2018. Pompeo, who made his initial visit to North Korea earlier this year as director of the Central Intelligence Agency, is scheduled to be in Pyongyang from Thursday through Saturday. His trip follows discussions Sunday at the Korean demilitarized zone between U.S. Ambassador to the Philippines Sung Kim and North Koreans. It was the first time U.S. and North Korean officials are known to have met since President Donald Trump held talks with Kim Jong Un on June 12 in Singapore. U.S. President Donald Trump holds up the document that he and North Korea leader Kim Jong Un had signed at the Capella resort on Sentosa Island, June 12, 2018, in Singapore. Sanders, however, declined to discuss reports citing both U.S. intelligence officials and commercial satellite imagery that North Korea continues to improve its nuclear and long-range missile programs. Trump recently declared “there is no longer a nuclear threat” from Pyongyang, due to his “great success” negotiating with North Korea’s leader. Satellite imagery and U.S. intelligence officials, contradict that assertion, revealing evidence of recent work at multiple secret sites in North Korea connected to the country’s production of enriched uranium for nuclear weapons. North Korea also appears to be finishing an expansion of a ballistic missile construction site in Hamhung. ​The Chemical Material Institute is known for making carbon composite parts for re-entry vehicles of solid-fueled missiles, Dave Schmerler, a research associate at the Monterey Institute of International Studies, said. When contacted by VOA, officials at U.S. intelligence agencies and other government organizations that keep track of North Korea’s development of weapons of mass destruction declined to dispute the assertions in recent news reports that intelligence officials have concluded Pyongyang does not intend to fully surrender its nuclear stockpile. North Korea, according to NBC News and The Washington Post — citing discussions with U.S. intelligence officials — is seeking to deceive Washington about the quantity of nuclear weapons and ballistic missiles it possesses and the scope of related facilities. A North Korean missile production facility in the city of Hamhung is seen from a satellite image taken on June 29, 2018. Also among the facilities under scrutiny is a secret underground uranium site at Kangson, believed to have twice the enrichment capacity of the well-known Yongbyon Nuclear Scientific Research Center. Commercial satellite imagery more than a week after the Trump-Kim June 12 summit also indicated improvements to the infrastructure at Yongbyon “are continuing at a rapid pace,” according to the 38 North website, run by the Stimson Center. Prior to the Trump-Kim summit in Singapore, North Korea announced the demolition of its Punggye-ri nuclear test site, where it conducted six announced atomic underground detonations. Experts have expressed skepticism that the demolition, which North Korea allowed foreign television to videotape from a distance, was much beyond the symbolic. North Korea also appears to have blown up a missile test stand north of Kusong. But “there have been no alterations or activity akin to dismantlement to any of the six known launch and engine test facilities and two ejection test stands,” according to 38 North. Analysts say none of this should be surprising, especially since what is meant by “denuclearization of the Korean peninsula” is interpreted differently in Pyongyang than in Washington and Seoul. 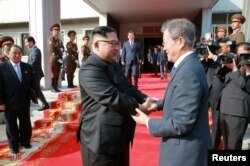 South Korean President Moon Jae-in shakes hands with North Korean leader Kim Jong Un during their summit at the truce village of Panmunjom, North Korea, May 27, 2018. 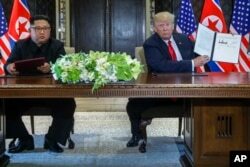 Kim, during his meetings this year with South Korean President Moon Jae-in, committed “to denuclearize South Korea by removing the U.S. nuclear umbrella and its forces from the Korean peninsula,” retired U.S. Air Force Lt. Colonel Tara O, an adjunct fellow at the Pacific Forum, tells VOA. National Security Correspondent Jeff Seldin and VOA's Korean Service contributed to this report.